When Harriet Westaway receives an unexpected letter telling her she’s inherited a substantial bequest from her Cornish grandmother, it seems like the answer to her prayers. There's just one problem – Hal's real grandparents died more than twenty years ago. Hal desperately needs the cash and makes a choice that will change her life for ever. She knows that her skills as a seaside fortune teller could help her con her way to getting the money. The brand new psychological thriller from the Sunday Times and New York Times bestselling author of The Woman in Cabin 10. 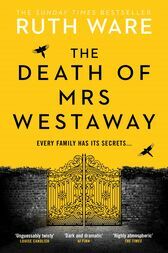 "The Death of Mrs Westaway is Ruth Ware's best: a dark and dramatic thriller, part murder mystery, part family drama, altogether riveting." Ruth Ware is an international number one bestseller. Her thrillers In a Dark, Dark Wood, The Woman in Cabin 10 and The Lying Game were smash hits, and she has appeared on bestseller lists around the world, including the Sunday Times and New York Times. The film rights to all three books have been optioned and she is published in more than 40 languages. Ruth lives near Brighton with her family. Visit ruthware.com to find out more.